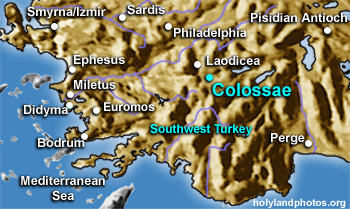 The site of Colossae is located on the southern edge of the Lycus Valley near larger and more significant sites such as Laodecia, 8 mi. [13 km.] to the west, and Hierapolis, 13 mi. [21.5 km.] to the northwest. It is approximately 112 mi. [180 km.] due east of Ephesus. Paul wrote two letters to Colossae, namely Colossians and Philemon. Paul evidently never visited the city (Col 1:9; 2:1), but rather his colleague Epaphras brought the gospel message to the three cities of the Lycus Valley, that is to Colossae, to Laodicea, and to Hierapolis. However, Paul hoped to visit the city, for he requested Philemon to prepare a lodging for him in anticipation of a visit (Phil 1:23). The mound (Turkish: hüyük) of Colossae has not been excavated. It was said to have been a large city in the fifth century B.C. but for some reason it seems to have lost some of its importance by the first century A.D. The reason for this is unclear, for its position on the major road running from east to west, from Pisidian Antioch to Laodicea and from there to the Aegean Sea remained unchanged. Possibly the new, northwest to southeast route, connecting Pergamum to Laodicea and Laodicea to Attalia (Antalya) via Cibyra and Termessos, which bypassed Colossae, reduced its importance.